The exhibit provides space to celebrate and grieve. In her installation, Oakland artist Favianna Rodriguez intertwines issues of immigration and migration. The moment you walk into the Metamorphosis & Migration: Days of the Dead exhibit at the Oakland Museum of California, a wave of serenity washes over you. Perhaps it's the shades of blues on the walls, or the captivating imagery surrounding each altar. It's an inviting space in which to honor the dead. Día de los Muertos (Day of the Dead) is the sacred holiday celebrated throughout Mexico on Nov. 2. For one day, the realm between the living and the dead overlap. It's a chance for families to honor those who have passed away by creating intricate altares (altars) and ofrendas (offerings), which consist of photographs of those who have passed, their favorite food or drink, and sentimental objects, all adorned with orange and yellow marigolds, papier mâché, and sugar skulls. For the past 23 years, the Oakland Museum of California has hosted the Day of the Dead exhibit. (Although, beginning in 2016, the museum decided to present the exhibit every other year, so there won't be one in 2018.) In each installation, different artists are featured, and while the general format is the same, the altars are always unique, each honoring someone special. 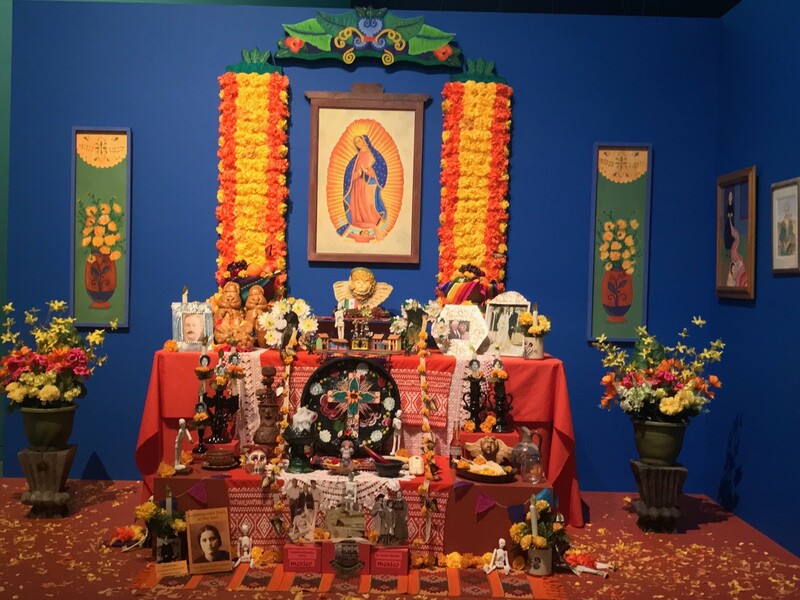 For this year's Day of the Dead, curator Evelyn Orantes said the ofrendas and artwork not only recognize the death of a loved one, but also mourn the outcome of last year's presidential election and the constant controversy surrounding immigration. "There was a sense of loss around the election," Orantes said. "What's great about Day of the Dead is that it reminds us of our humanity and our interconnectedness. Death is the common equalizer, no matter if you're rich, poor, skinny, tall — no matter what, we will all experience death." 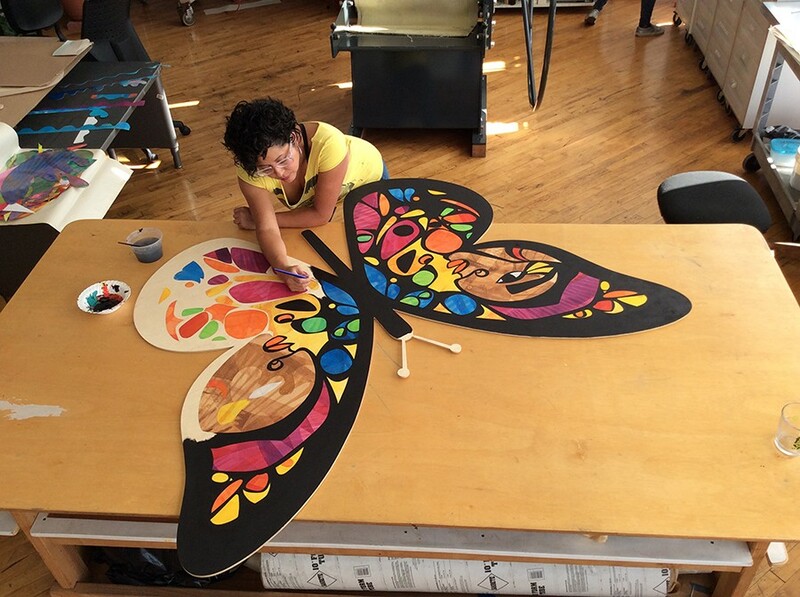 Orantes said it was important to incorporate a migration theme into this year's exhibit, so she reached out to Oakland artist and activist Favianna Rodriguez, who is known for using butterflies in her protest artwork representing the plight of immigrants. "Artists can put images to the words that we can't always say," Orantes said. 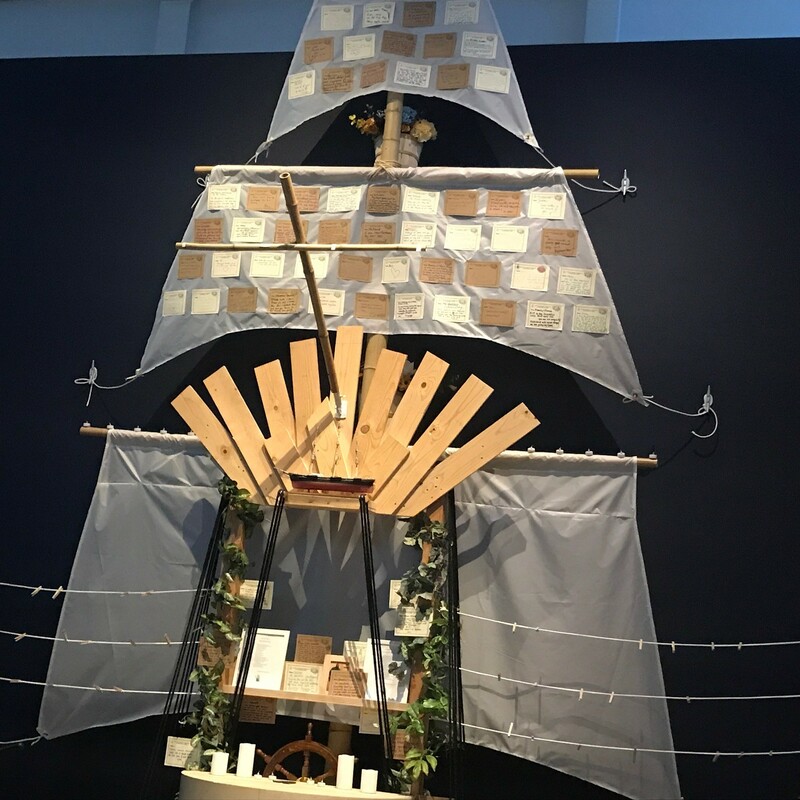 Rodriguez's installation depicts the monarch butterfly and its migration route, intertwining issues of immigration with conservation. And there's another connection: In Mexico, the monarchs' arrival represents the souls of loved ones returning home. Another installation is by artist Bea Carrillo Hocker in which Hocker pays homage to her family, her lineage, and the sacrifices made by her ancestors in order to immigrate to the United States. Fernando Escartiz was commissioned to create an 11-foot papier mâché sculpture of a calavera. The calavera depicts a man carrying a briefcase with his most prized belongings, representing those who leave everything behind in order to forge a better life in a different country. Orantes also enlisted students from Oakland International High School and Thornhill Elementary School to participate in the exhibit. While Day of the Dead is a Mexican tradition, other cultures honor their loved ones as well, and the curator wanted other members of the community to be represented. One of the most striking installatioons is the one about the Ghost Ship by Chris Treggiari and Peter Foucault. The fire that killed 36 people in December 2016 touched the OMCA family in a direct way. One of the victims, filmmaker Alex Ghassan, had contributed to the installation Oakland, I want you to know... earlier that year. OMCA wanted to honor his name and legacy, and all of those who lost their lives on that tragic night. Orantes said many OMCA staff members were at the party and managed to escape. "We wanted to recognize lives lost through fire," Orantes said, adding that "shortly after Ghost Ship, there was another fire in West Oakland, and there was little to no attention to that one." Installation by Chris Treggiari and Peter Foucault. Chinese-born artist Hung Liu showcases a series of paintings that were used at her solo show, Summoning Ghosts, at OMCA in 2013. The paintings honor the passing of Liu's mother: Each canvas depicts loss, mourning, the transformation from death, and the completion of the life-and-death circle. Outside of the exhibit in the Oak Street Plaza, there's one more piece — a mural by Mexican-born artist Jet Martinez, known for his Mexican folk art-inspired murals that can be found around downtown Oakland. The mural follows the theme of the monarch migration, with bright orange colors like the wings of the butterflies and the marigolds. With this year's installation, Orantes was able to capture the correlations between life and death, the hope that comes with immigration, and the mourning of what is lost along the way. "Metamorphosis reminds us of our humanity and how death brings us together," she said.